Warrendale (Detroit) Blog: Progress on the Southfield Fwy. 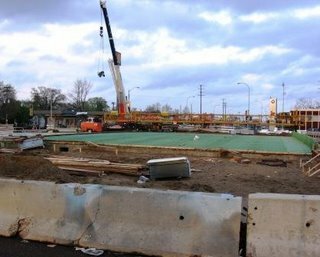 It looks like M-DOT is making progress on the W. Warren Avenue bridge over the Southfield Freeway (M-39) slowly but surely. Their work is actually moving rather quickly when you think about all of that is involved with it. However, it seems like it takes a lot longer when it's your morning commute that is messed up by the detours. 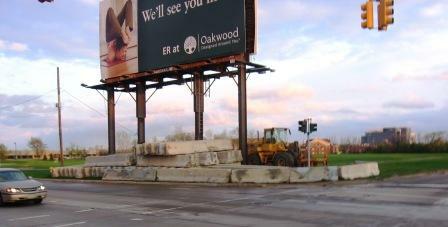 M-DOT's media advisory says that the project is supposed to last until July. However, given the rate at which they're moving, I wouldn't be suprised if they finished it a couple of weeks early. And if I'm not mistaken, it looks like they've concrete barricades already lined up at the southeast corner of Paul and the Southfield Freeway. I presume that they're in anticipation of the next phase of the project - rebuilding the Paul Street and Tireman Road bridges over the freeway. I'm actually looking forward to that part of the project - construction detours and all. The Paul bridge really needs to be rebuilt. It would be a godsend to get the Paul Bridge rebuilt. I hate having to detour over that thing every morning so I can get to work. BTW... saw this blog listed on Wikipedia. It's really nice to have an updated "news source" for our neighborhood!